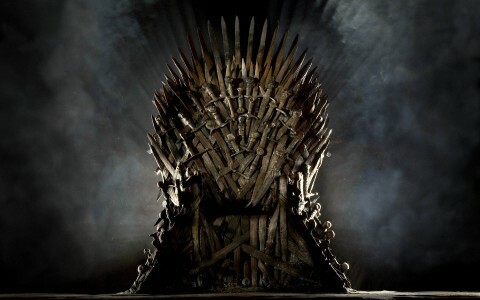 By Anonymous, As a life-long nerd and fan of the show, I have mastered all the trivia games and can remember each hilarious episode perfectly! 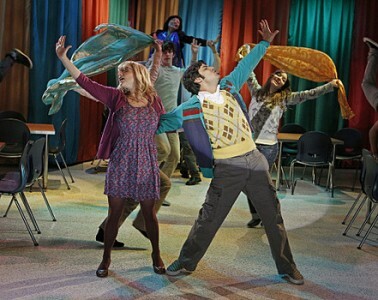 It all actually started when Penny moves in across the hall from Doctors Leonard Hoffstadter and Sheldon Cooper who work for the Los Angeles University. What started as a nerd-parody has grown into a huge cultural sensation and even turned the tables on jocks who have been seen as the pick of the litter. 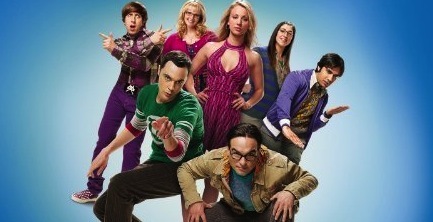 Now is the age of the nerds, geeks and dweebs! But besides just showcasing nerd and geek culture, the show has done a great job of showing the realms of cosplay (or using costumes as part of a hobby or event) and both dreams and/or daydreams of the characters giving us an almost Jungian look at their personalities! 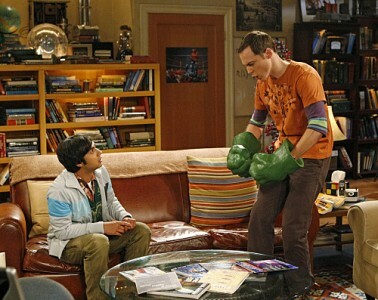 While this constitutes a minimal costume at best, Sheldon's adopting of the Hulk's manner of speaking puts it on the list. Sheldon even wears the hands in front of a potential date and what drives her away isn't the quirky partial costume, it's Sheldon going off to bed after bidding her, "Goodnight, puny human!" Howard has always had a way with the ladies either in person or (predominantly) in his mind. A routine bath with imaginary Captain Starbuck takes an unexpected turn, though, when she asks him why he's fantasizing about her when he could be with a real woman like Bernadette, thus ending the fantasy but bringing Howard to a much needed conclusion to act on his feelings for his new girlfriend. Dress Up (Cosplay) #2: Justice League Costume Contest Winners! After years and years of trying to put a full Justice League together for Stuart's New Year's Eve Party and Costume Contest the group finally gets Penny to play Wonder Woman (dark wig and all) and her boyfriend to portray a perfect Superman, winning them the contest. The victory is well accepted even with Raj on an embarassing fake seahorse as Aquaman and Sheldon unable to give an acceptance speech. When the group finds a replica of 'The One Ring' used in the films, a bitter rivalry ensues as to who should have it. After a strange 'hands on or nothing' contest, Sheldon dreams of winning and goes to polish his prize only to find that it has transformed him into the hideous creature Gollum while grasping his 'precious'! It's not unusual to see kids, even men-children and women-children, playing doctor. 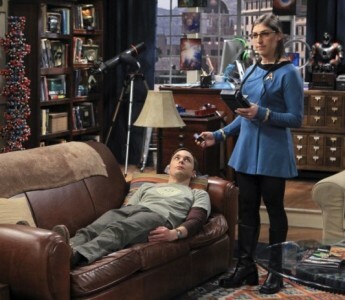 It is a little strange to see Sheldon sharing one of his pasttimes with his new girlfriend, Amy, now dressed in Star Fleet attire as a medical officer! 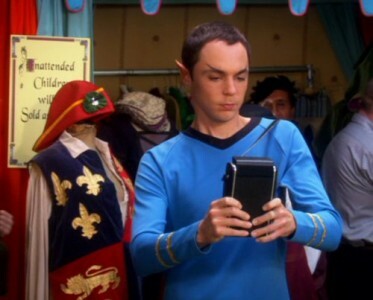 When Sheldon dishonestly replaces a toy that he broke for one of Leonard's without telling him, he dreams of appearing on a Star Trek world where the action figured voice of Leonard Nimoy asks him to do the right thing . . . before pointing out that there's a Gorn right behind him! 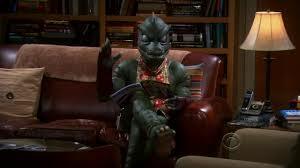 To make matters worse, the sequence turns out to be a dream within a dream and Sheldon walks into the livingroom only to find the Gorn . . . sitting in HIS spot! Enterprise or bust! When the group dresses up in their favorite Star Trek costumes for a venture to a convention only to have their transportation break down and leave them stranded on unknown terrain in the desert! 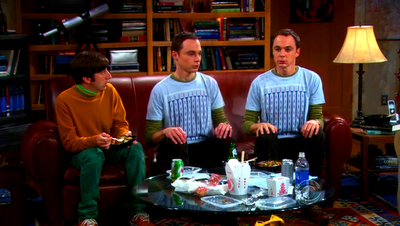 At first it seems like a joke when Leonard says that he assumes the only way Sheldon can reproduce is by eating too much Thai food and then splitting into two Sheldons. 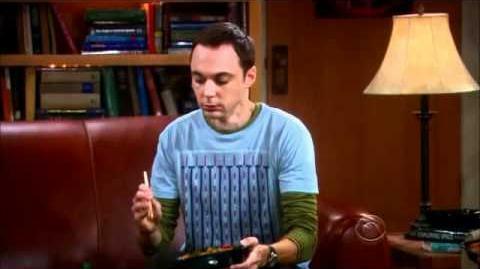 But then after a bite too many of Thai food, Sheldon starts to feel strange . . . and suddenly this happens! And voila! Now through the process of Thai-food based mitosis another Sheldon is born . 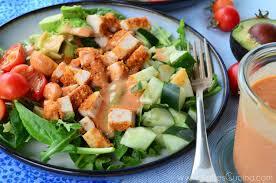 . . or rather, copied! It's their first time being invited to a Halloween Party away from the Comic Book Store or other alike locations so all the gang decides on their best costume; unfortunately it's the same costume: The Flash. Although, the suggestion of having them stand in order of height to give the appearance of comic book running was a pretty good one! 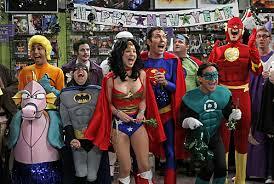 Dream Sequence #5: Sheldon's Flash Screams in Frustration! 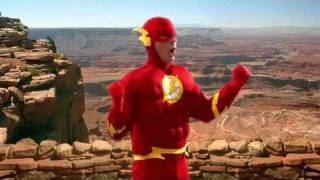 Speaking of The Flash, when Leonard announces a small degree temperature change on their thermostat Sheldon takes a moment to have a daydream in which he (as The Flash) races to the Grand Canyon to vent his frustration before swiftly returning and calmly agreeing with Leonard. If only all change was that easy for Sheldon. 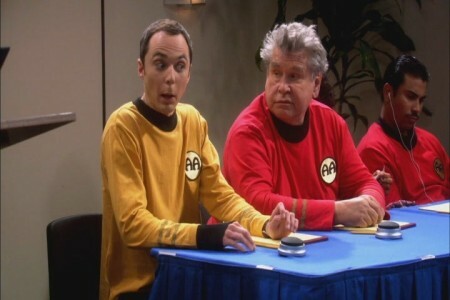 You might be noticing a pattern in a preferred genre of uniforms, but rather than Star Fleet, this replica set for Sheldon's Physics Bowl Team is instead called The Army Ants or AA (which may or may not be better than Leonard's Prepetual Motion Squad or PMS). When the gang accidentally purchases the real H.G. Wells Time Machine from the set of the movie together, they find it difficult to handle as a group and it even leads to a cruel outburst from Penny making Leonard regret his favorite pasttimes. 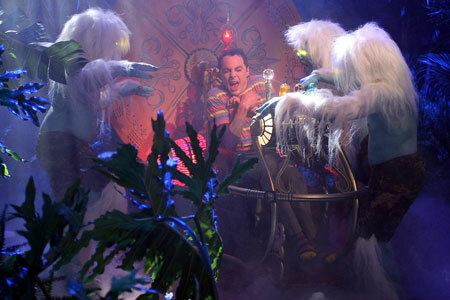 By the end of the show, Sheldon decides to take his turn in the middle of the night only to attacked by Morlocks! When awakening from the dream he demands they get rid of it to Leonard who assures him that movers are coming to take it away, but the movers turn out to be (dum dum dum) Morlocks! 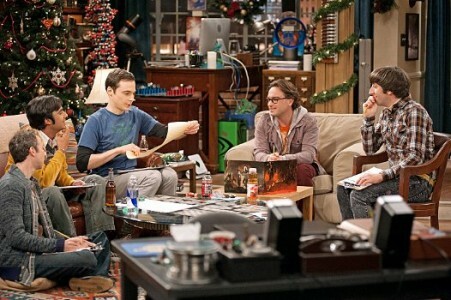 The dream within a dream ends in Sheldon screaming for Leonard. 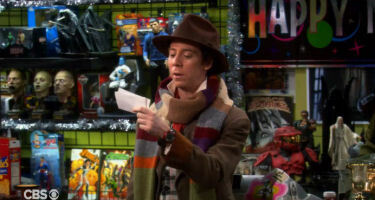 At a costume party, Stuart brings the British Charm of The Doctor to the scene with his home-made Tom Baker's Incarnation costume and it does not at all disappoint! Before Spike Jonze had Joaquin Phoenix romance 'Her', Raj dreamt of finding the voice behind Siri and having the woman fall madly in love with him just in time for him to question what love really is and who he really wants to be with. Timing just isn't always on the side of love! Besides science and science fiction, our gang keeps themselves good and cultured with costumes at local Renaissance Fairs though Sheldon continues to point out inaccuracies for some of the patrons and proudly announces that he even made his own accurate underwear! But to make the illogical inaccuracies logical, Sheldon, at the suggestion of Leonard, must (of course) don the costume of Mr. Spock! Now he is a time-travelling Star Fleet Officer observing Earth's Past and is finding 'anomalies' instead of inaccuracies! It seems like Howard is going to end things with Bernadette which gives us a chance to see what Raj really has to say about the matter . . . he is madly in love with Bernadette. This manifests itself as an incredible Bollywood Musical number in which the two sing about being one another's 'heart and universe'. 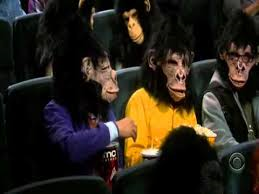 To escape a sick Sheldon, the group heads to the cinema in Ape masks for a Planet of the Apes marathon where their alibis of being unavailable and not being seen can remain solid! Unfortunately for those that wear glasses, Ape masks aren't the best choice of cover-up. It looks as though Penny will be late for work, what will she do? Leonard steps out, rips away the caution tape, puls apart the door, and tosses his glasses aside while he takes Penny into his arms in true Superman fashion! The two even manage a passionate kiss in this dream while he glides them safely down the elevator! 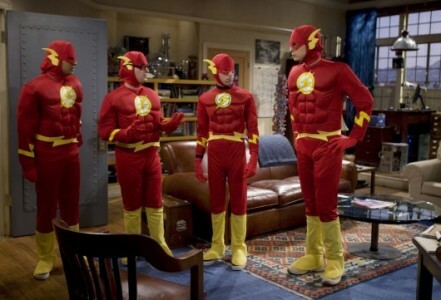 Penny is surprised at the prompt arrival of her four neighborly guests who have changed out of their Flash costumes and into some more quirky ones; Howard as a Peter Pan looking Robin Hood, Leonard as Frodo Baggins, Raj as The Mighty Thor (who gets to lay his hammer down despite being unable to speak to his date), and Sheldon as the obvious Doppler Effect! While Howard is no stranger to fantasies with sci-fi heroes, it does start to bother him when both Captain Starbuck and George Takei won't stop giving him relationship advice at inopportune moments in his subconscious! 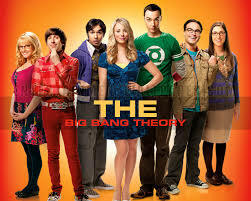 So whether you've gotten back into Star Trek, taken yourself back into Middle Earth, wandered back through time in the TARDIS, or started playing Dungeons and Dragons because of the show, we can all thank the nerd-parody known as The Big Bang Theory for bringing our geek-life to the forefront of what's popular and what's enjoyable!